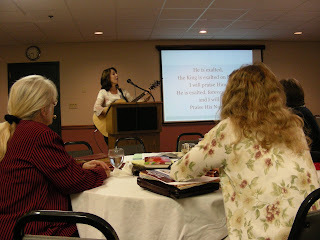 Melinda Cosentino, of Canton, Ohio, leads worship at the end of Saturday’s evening session at the Women’s Leadership Summit, which concludes this morning in Wyomissing, Pa. The leadership summit is sponsored by Women of Grace USA. It will be held next year on October 24-26 at the same location. Below are more photos from the weekend.